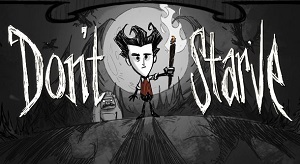 … is probably a better name for Don’t Starve, at least as far as I’m concerned. This was on deep discount in the Steam Summer Sale, so I picked it up (along with its DLC, Reign of Giants, though I haven’t played around with that yet). I’m enjoying the hell out of this game, and I’ve put in 30 hours just in the last week. I’d describe Don’t Starve as a roguelike meets Minecraft. You play as gentleman scientist Wilson (or, once you’ve unlocked them, another W-named character), thrust into a savage wilderness by mastermind Maxwell. To survive, you gather stuff you find lying around — twigs and flint become an axe, and with an axe you can cut down trees; with logs and cut grass, you can make a fire. Over the fire you can cook the berries and carrots you’ve collected while logging, fulfilling the title’s imperative. Eventually you’ll want a science machine (gold, rocks, and logs), which allows you to make stuff like backpacks and shovels. In my current game, which is the farthest I’ve gotten (40-ish days), I’ve built up to farms, lightning rods, crock pots, drying racks, beehives, and a birdcage with an egg-laying bird. There is much, much more one can do, too — this is not particularly far, game-wise. Speaking of which, there’s no end goal, at least in Sandbox mode; it’s just “survive as long as you can.” There’s an Adventure Mode, too, which sounds more like a campaign mode? But I haven’t done anything with it yet (though I do know where Maxwell’s Door is in my current game). The art is sort of cartoony gothic, a la Edward Gorey or Tim Burton, and the general aesthetic is vaguely steampunk. Nobody told me there was a sanity mechanic! I thought the brain represented, I dunno, intelligence? Brain power? Which is why sleeping made it go up, right? I didn’t realize the first time I was going crazy until shadow creatures were attacking me, and bunnies I trapped turned black and dropped beard hair or nightmare fuel instead of meat. Let us not speak of the fact that this was the game where I took to digging up graves, not realizing how much THAT lowers your sanity. I have, in fact, starved a few times. Sometimes due to my own ignorance as to, say, how much Monster Meat it was safe to put in a crock pot — which I’m going to count as starvation-related. A large number of my deaths were spider or bee related, as the title of this post suggests. A few times, it was cold that got me — this is the first winter I’ve lived through. And sometimes, it was dumb stuff like letting the fire or the torch run out and not having a replacement ready before I was eaten by Charlie. I was warned against pengulls, but I guess they’re non-aggressive? But the first time a flock of them jumped out of the sea at me, I nearly had a heart attack. I’ve taken to using them (or beefalo, or pigs) to fight hounds for me. It is a truth universally acknowledged that the more beautiful the garden you cultivate in your base camp, the more likely it is to get struck my lightning and burnt down. Hence the lightning rod. Beefalo in mating season + guardian pigs = ingredients for a Beefalo Hat That was last game. This game I just stuck two bunnies to my head and made Rabbit Earmuffs. Because that’s the sort of game this is. Also Wilson’s fabulous beard provides significant insulation! (Of course, I realize by writing about my current game I am doomed to imminent failure. That’s the way it’s always worked with me and roguelikes). In parting, have some adorable Maxwell fanart that I came across on the Don’t Starve subreddit. Also I need to get more sleep, to increase my sanity. IRL.